When browsing on one of the many food blogs I follow, I came across a suggestion that the only way to really smooth hummus is to peel the chickpeas. That’s right PEEL the chickpeas. Your first reaction, as mine was, might well be that life’s too short. I even considered just putting in the recipe that you should peel the chickpeas, but chucking them in whole myself. But then, I guess that would be cheating. So peel them I did (I’ve included a picture of my beautifully peeled chickpeas as proof of my efforts). You can actually get quite into the rhythm of squeezing the chickpeas and popping them out of their skins – although don’t do it when you’re in a rush, or you’ll probably just give up and bung them in whole. This is not only the first time I’ve peeled chickpeas when making hummus, it’s also the first time I’ve measured all the ingredients – usually I just blend random amounts until it looks about right. 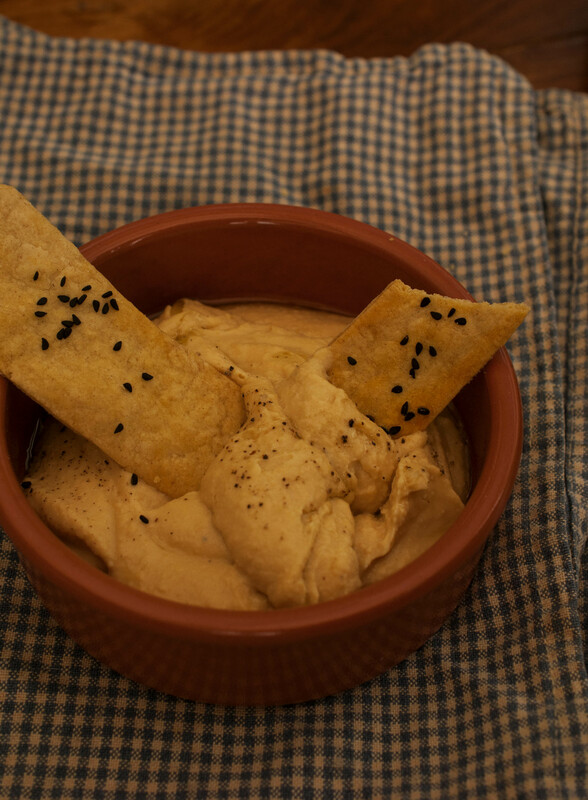 I’ve made a few amendments to the basic hummus recipe of chickpeas, tahini (sesame seed paste) and olive oil, to make the result slightly more interesting. I’ve added roasted garlic and honey for sweetness, and wine wine vinegar for a bit of a kick. 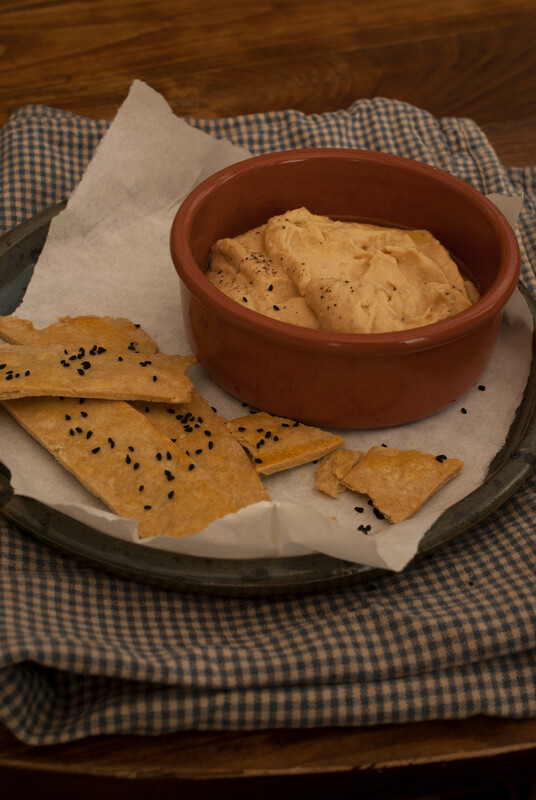 I knocked up a batch of olive oil crackers to serve with the hummus. 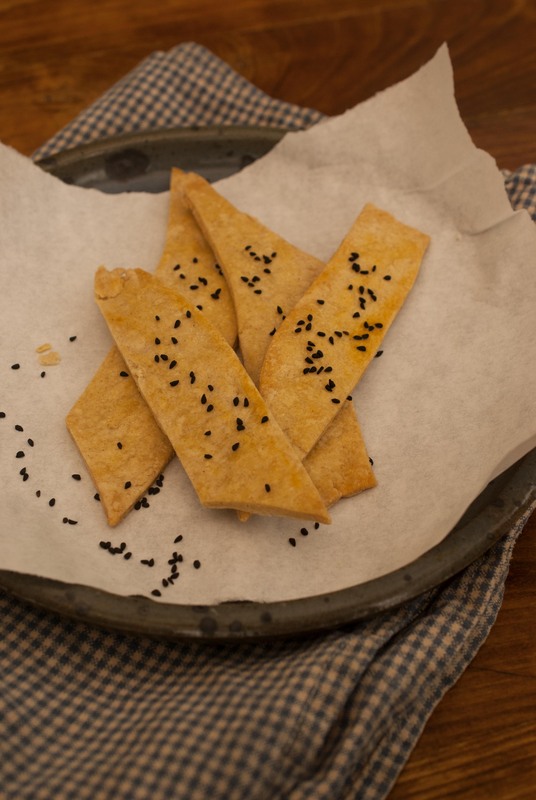 They are sprinkled with Nigella seeds – which, by the way, are also called kalonji black onion seeds. They are nothing whatsoever to do with Nigella Lawson, although she likes to pretend they are. Preheat the oven to 160 C. Roast the garlic cloves in their skins for 30 minutes until soft. Meanwhile, get on with peeling the chickpeas- give them a squeeze and they should pop easily out of their skins. Blend the peeled chickpeas together with the tahini, vinegar, lemon juice, olive oil, honey and 3 tbsps of water until a smooth paste forms. 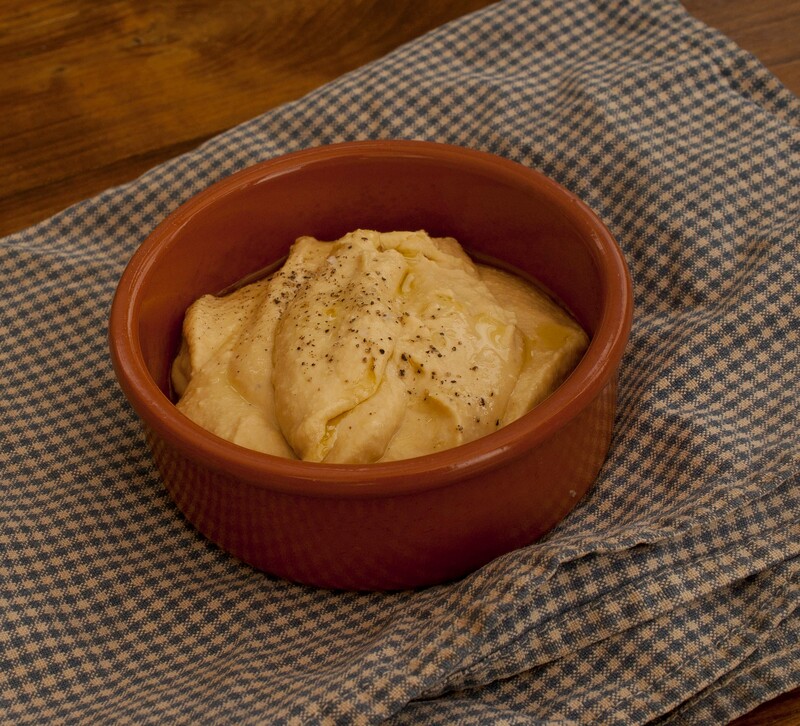 Squeeze the roasted garlic out of its skin and add to the hummus, then blend again. For the crackers, grease two baking trays. Sift the flour and mix in the oil, salt and pepper, and beaten egg (reserving some egg for brushing the crackers). Roll out the dough to ½ cm thick. Cut into rectangles and put on trays. Brush with the leftover beaten egg and sprinkle with nigella seeds. Bake for 10-15 minutes, until just starting to go brown. Leave on a wire rack to cool. This entry was posted in Dips, Savoury, Vegetarian and tagged garlic, hummus, olive oil. Bookmark the permalink.